I’ve been majorly holding out on you guys with this soup!! I made way too many Christmas treats last year (wait; is that even a thing? SLASH saying “last year” feels kind of crazy…time flies!) that I had to share before Christmas had come. So treats did take precedence over soup. This soup has been photographed and ready to share for over a month now, but I hadn’t gotten around to actually typing out a post. ? And then I promised on Instagram it would be coming over two weeks ago. Major fail. ? But it’s here now and you’re going to want to eat this soup every night for the rest of this winter! ? Several months ago I threw my (now married) sister her bridal shower. We decided to do some soups, salads, a caramel apple bar, and a few other desserts. One of the soups was a chicken enchilada chili. My family is addicted to the chicken enchilada chili at Zupas so I tried my best to re-create it for the shower. While it was delicious, it wasn’t quite how I wanted it. After the shower there wasn’t a spoonful left so I had to re-make it for my boys. This time I changed it up quite a bit and it tasted pretty identical to Zupas. Instantly this soup became a favorite! A favorite for me (talk about EASY– just a dump it and forget about it kind of meal), and a favorite from the boys taste-wise. They inhale this soup! I’ve tweaked the recipe a few more times since it’s already been made half a dozen times. This has become our “Sunday meal” — put it in the slow cooker before church and dinner is ready when we get back! ? This soup is quite mild depending on the enchilada sauce you use. I’ve used both mild and medium. Medium is our personal favorite (and not too spicy for the 2-year old), but if you are super sensitive to spice, stick to the mild. 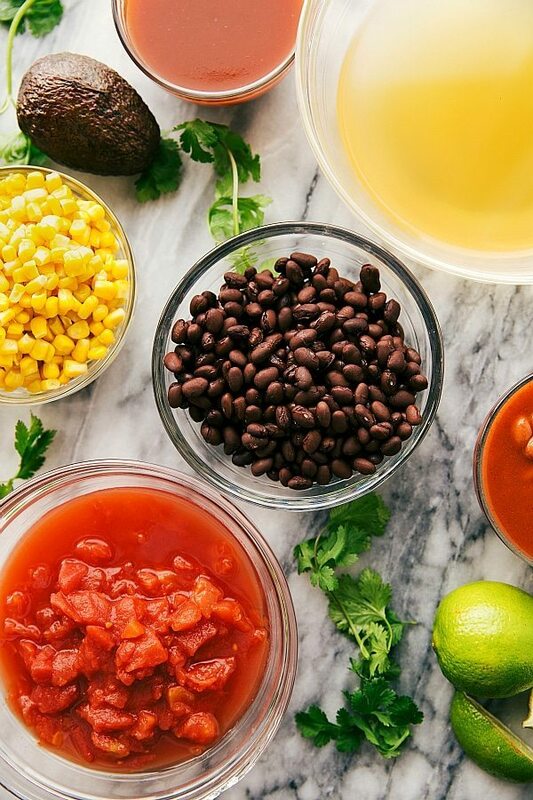 And as you know, all store-bought enchilada sauces aren’t created equal — some are definitely more spicy or more mild than others so use an enchilada sauce you know and love! Alternatively, you can substitute your own homemade enchilada sauce if desired. Just keep the quantities about the same as a 10-11 ounce can (about 1 and 1/4 cup). If you want more spice, I’ve also added a little chipotle chili powder a few times which is delicious. You could add in some jalapeños or extra green chilis — whatever you like that gives a chicken chili more “spice” should work well in this soup! Then as far as toppings? Cheddar cheese is a MUST! This soup is seriously good with tons of cheese mixed in….plus — cheese strings: ?. I also love sour cream — we use fat-free and it’s delicious in this soup. While I absolutely love a squeeze of fresh lime juice and some cilantro, neither are a “must.” And avocado is just for a nutritional boost (plus so tasty in this soup) if you like avocados. The husband thinks they are a little weird in soup, but I love ’em so that topping is up to you! A simple and tasty creamy slow-cooked chicken enchilada chili. No cream of "x" soups needed! I like to cut each chicken breasts into 2-3 pieces after removing the fat only if I'm cooking this on high (cooks faster/more evenly in my crockpot). *I've used Rosarita brand, Old El Paso, and Great Value brand (medium and mild, medium preferred for us, but use what you like best) **You can use just plain diced tomatoes if desired, it still tastes great! This chili looks so yummy Chelsea and I am on the same page as you! I still have few recipes sitting waiting to be posted which I made in early december. Pinned! Oh my goodness, this was such a hit! I made it for myself and the boyfriend last night, and he just texted me and told me he wishes he’d brought more with him for lunch 🙂 It was truly one of those “set it and forget it” recipes – I put it together before leaving for work, set it at 8 hours on low, and came back to chicken so tender I shredded it using a spoon. What an awesome chili – I definitely plan on making it again! Yay!! So great to hear that! Thank you Jami!! I made this for a work party today and it is AWESOME!!! YEAH! So great to hear! 🙂 Thank you! I used frozen chicken and it worked great. 🙂 great recipe, very easy and tasty! So happy to hear you enjoyed this recipe! Thanks for the comment Kaily! Loved it! My boyfriend ate so much he couldn’t eat ice cream after, which is really saying something. Haha that is awesome!! 🙂 SO great to hear it! Thanks for the comment! The cream cheese took a long time to melt and didn’t quite blend in . Hmm. I’ve never had a problem with that. Did you use a lower fat cream cheese? Also it will be best if it’s not straight out of the fridge next time perhaps soften it a bit before adding it (the instructions list the cream cheese should be softened). It should blend in perfectly and be completely smooth. Absolutely delicious! Thanks so much for the recipe! I’ll definitely be making this again. So glad to hear that! 🙂 Thank you Brooke!! What are chili beans in mild chili sauce? I live in Canada so we don’t have as much variety of things as people in the USA do. Any suggestions for substitutions? made this today- excellent! Can’t wait to make again. Awesome!! So glad you enjoyed this! Thank you for the comment! I made this the other week and it was so tasty. I’d like to make a big batch and freeze it in small portions for lunches. Do you think it would freeze well? I’m worried about the cream cheese. So happy to hear you enjoyed it! I haven’t ever tried freezing this, but I don’t think it would do too well because of the cream cheese. Wish I knew for sure! Hopefully someone else can chime in here! Hm, maybe I’ll try freezing without the cream cheese and add that right before eating. I suppose freezing it would do strange things to the texture. I make it all the time – it makes so much and I freeze the leftovers – it freezes great! So glad to hear it! Thank you! For the petite tomatoes with green chilies, can I use rotel instead? I’m wanting to cook this, but can I use beef instead of chicken? If so would I need to substitute the chicken broth with water or just keep the recipe the same? Thanks. Are you cooking the beef first? I would probably substitute beef broth in place of chicken broth. I’m not sure how well all the other flavors will go with it, but I think that should be better.. I made this today for dinner and everyone loved it, including a picky 2 year old. Thank you for all of the great recipes! I will definitely be coming to your site more often. 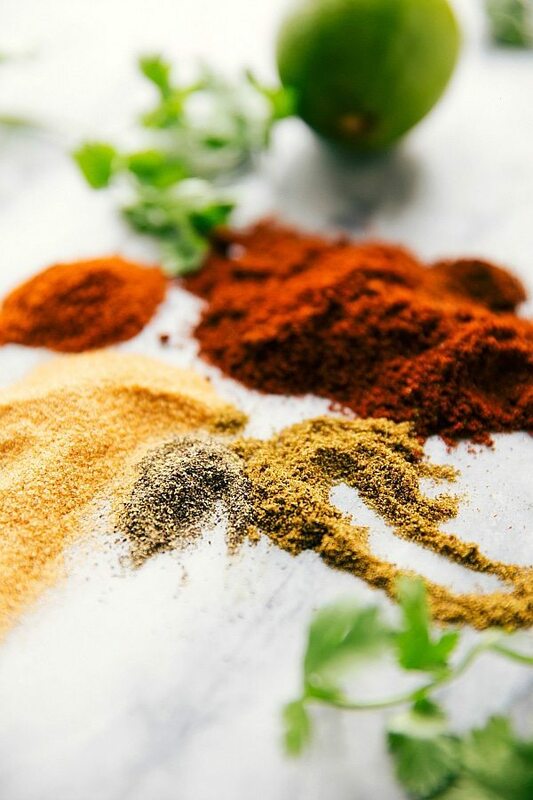 Can I use taco seasoning instead of spices? I’m so happy to hear that! 🙂 Thanks so much Kimberly! Can I skip the cream cheese and still have it come out good? I’ve never tried it without cream cheese, but it is pretty integral to the creaminess and the overall recipe. Can something else be substituted for cream cheese like sour cream or half & half? I’m not a huge fan of cream cheese flavor except on bagels. I used it in another recipe recently and it gave the food a weird flavor. So happy to hear that Tina! 🙂 Thanks for the comment! Where can I find the nutritional info? I made it with only one pound of chicken (since that’s what I had on hand), but otherwise followed the recipe exactly. (It was delicious by the way). With everything added up, the entire pot was 3,075 calories. Just divide that up into servings. 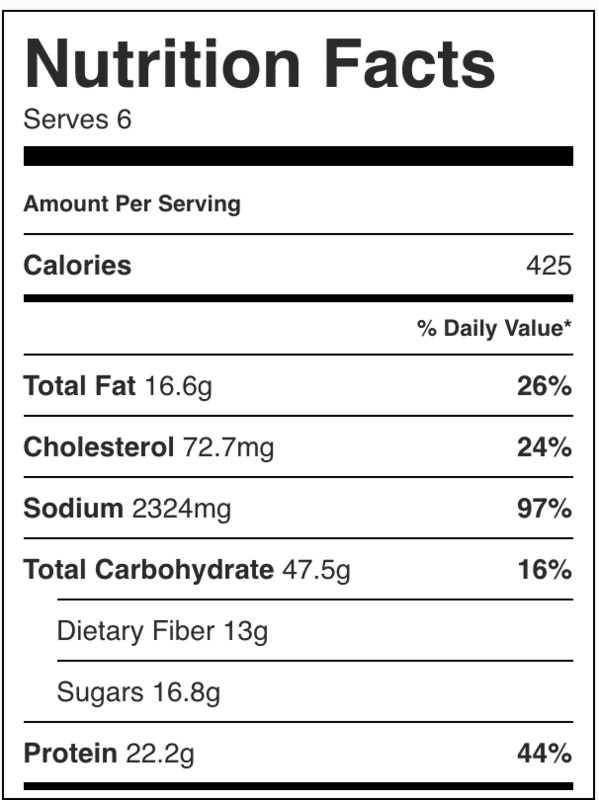 I’m not sure on the other nutritional info, but that’s how the calories pan out anyway. It’s a great recipe! Thank you so much for sharing the nutrition info Jade! 🙂 Glad you enjoyed this soup! I have all the ingredients except for a can of chili beans and cilantro (a must for me for anything related to chili or enchiladas). So excited to make this tomorrow! I ran across this recipe while trying to find a recipe with what I had on hand. And I have to admit I had my doubts because of the enchilada sauce, i’m not a fan. But the cream cheese complimented this and really brought it together! Delicious!!!! My whole family of 7 LOVED it, myself included. Everyone talked about how good it was between bites! Wish i knew how to make this with beef too! This will absolutely become a new dish in my home! Thank you for sharing!! Oh! This looks GREAT!! I’m planning on feeding a crowd. Could I double this recipe in the Crockpot? Thanks in advance! LOVE this recipe!!! It is soooo delicious and EASY! I will definitely be making this often! Thank you!! SO happy to hear that! 🙂 Thanks for the comment Megan! I made this for our church group last night and it was a hit. The only change I would make is that 2 cups of chicken broth (stock) is just too much. I would at least 1/2 that amount. The taste was great though. I am so glad this was a hit and the taste was enjoyed! 🙂 And reducing the stock or broth to personal preference will be great too 🙂 Thanks for the comment Amy! What type for chili beans do you use? Pinto, black, kidney, etc.? I use the actual chili beans in chili sauce at the grocery store 🙂 They are called “chili beans” in mild/medium/hot chili sauce. Thank you for the recipe! This turned out amazing! I served it over spicy spanish rice and the whole family loved it!!! So happy to hear this was enjoyed! And the Spanish rice sounds delicious! 🙂 Thanks for the comment Joana! I’m going to be making this for dinner tomorrow and was wondering if I used chicken tenders instead of the breasts would it still turn out? That should work out fine! 🙂 Enjoy! I just found this recipe and am definitely going to be making it soon! I’m happy to find your blog as well. So happy to hear you enjoyed it 🙂 I’m glad you stumbled upon my site as well! Thanks Chandra! Do you think I could leave out the cream cheese and the soup would still turn out ok? It will definitely be more bland without the cream cheese (it’s pretty important ingredient in this soup! ), but it will work out. I don’t put in the cream cheese and its always good .. sometimes I will add a little cheese on top to have that extra to it but I don’t need the extra calories either .. Stumbled across this recipe last weekend and have been thinking about it ever since. Finally made it today, and both my husband and I loved it. Thanks for sharing, and I look forward to searching your site for additional recipes. I’m so happy to hear you both loved it! Thanks for the comment Stacy! 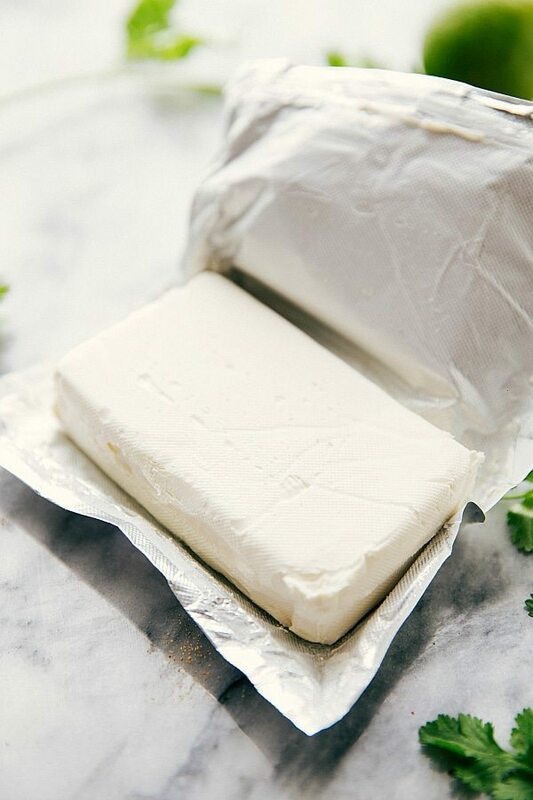 Any idea how to make this into a freezer meal to have on hand ? This was a great recipe! Very easy, no chopping for prep, just open the cans and dump. Loved it! Shot of lime juice with the garnish really topped it off. Definitely a hit at our house. So great to hear that! 🙂 Thank you George! I’ve made this THREE times now and it’s always amazing. My family loves it, even my husband who swears he doesn’t like soups. This is seriously easy and one of my favorite things to eat right now! Well done!!! This is my current favorite recipe, in fact it’s sitting in my crockpot for the third time in the past month. I skip the cream cheese and limit the chicken to a pound just to reduce calories. Next time I’ll try it with half the amount of cream cheese and see how it goes. I also double the corn because we love corn over here, lol. Hubby adds low calorie, thin yellow corn tortillas to the bottom of his bowl and of course a dollop of light Daisy sour cream brings it all together. We love it, thanks again. That is so great to hear! I’m truly thrilled you’ve enjoyed this recipe and that it’s even made the favorite 🙂 Thank you Hunter for sharing your changes and the corn tortillas sound AMAZING! Did you soften it well? I’ve made this soup dozens of times and so have a lot of readers without problems, so I’d love to help you trouble shoot…Was it full-fat? How soft was it? Did you let it sit on high heat and then stir it well? Absolutely love this recipe, so easy and tastes great! I’ve probably made it 3 times in the last month. I noticed a few people were having trouble with the cream cheese, mine also wasn’t blending (softened in microwave for 10 seconds). What worked for me was using a medium sized whisk and mixing (fairly fast) for about 5 minutes or until it started to blend. Hope that helps! Chelsea first off I want to thank you and also my wife for turning me on to Pinterest. Here is my story. I work for Applied Materials in Santa Clara Ca, I am part of the legal department and we did a Tommys Best Chef competition Series. I actually came in mid competition and one the Crock pot comp with my Nawlins style Red Beans and rice. In the next competition I was one of the top three so I was in the finals. We all agreed to do Chili. I knew I didn’t want to do traditional so my wife said I should try Pinterest. Thats where I found you and your wonderful recipe! Well I decided on your chili and called it Zupa’s Style Chicken Enchilada Chili. When I went to bed I was not very confident I would win against two good cooks with traditional chili. We did blind tasting and the results were announced at our holiday party. All the proceeds from the various competitions were donated to the Second Harvest food bank. Well you will be happy to know your chili (cannot call it mine) 😉 was announced as the winner!!! I was so proud. Won a nice trophy and a best Chef apron and a gift basket with a one hundred dollar GC to Sur la Table. Everyone loved the chili and so did my family! In fact when my wife woke up the morning of the comp she came in and woke me up and said,”I don’t know what the other two contestants are bringing to the tablebut this is going to be very hard to beat”. Thanks for sharing the recipe Chelsea. It was a direct HIT! One other thing to note. I decided to use Medium Enchilada Sauce (1 10 oz can) and then added a little of the hot. About a quarter can. I chickened out on two full cans as I was doubling the recipe. Seemed soupy to me. However the next morning it did thicken a bit. In retrospect I probably should have dumped more in because during the time the servers were serving the chili people were asking for more of the broth and as we got down to what was left to take home I lost a lot of liquid. I also did not have a real issue with the cream cheese. I added it in cubes at the three hour mark when things were really cooking. I did whisk it but man that cream cheese really settles down the bark of the enchilada sauce to perfection. For a almost no prep dish I almost feel as if I cheated. LOL. I also made some jiffy cornbread but substituted Sweet cream corn for the milk (whole can) with two boxes. To Die For. Thanks again. Ooo that cornbread sounds amazing!! Thanks for sharing! I am seriously so happy about this comment! 🙂 It made my day! What a fun competition and CONGRATULATIONS! That’s so exciting you won!! It takes a great cook not just a recipe to win a contest like that 🙂 Thanks so much for sharing Derrick!! Awesome Recipe Chelsea. I won a Chili cookoff with your recipe. Thanks for sharing. So glad I didn’t go traditional chili. This recipe is amazing I put it in the crockpot last night before bed and woke up early this morning and finished making it. It tastes delicious and I know my inlaws will love it for our christmas party today. I do have one suggestion for the cream cheese that made it really easy to mix in though I used a hand mixer and blended it before putting it into the soup and it made it much easier to mix in. Loved this soup I will definitely make it again! Look forward to trying this recipe! Do you think shredded pork could be used instead of chicken? Are you thinking of adding it already cooked? It won’t cook in the same time as the chicken, but I think it will be okay taste wise! This looks really good. Thinking of trying it minus the meat. I’m a vegetarian, will it work to make this without the chicken? Made this today and it was wonderful! I took some of the hot liquid out and added the cream cheese then wisked it until smooth and added it back in. Worked like a charm. Will definitely make this again. Remarkable! So yummy – it’s been “cold” (44F) in south Texas, so I needed chili in my crockpot immediately. This was a good choice and I can’t wait to serve it to my honey tonight! Thanks! I’m curious about this too!!! I made this over the weekend and it was a hit! Soo easy to throw together, let it cook and enjoy- it was DELISH thank you! I was just wondering how this is not too hot with 1.5 TBSP chili powder? I am Australia and our chili powder is 100% ground chillies and this much would make it very very hot (I love hot food). Maybe you mean chili seasoning mix? This was absolutely delicious!! My family loved it and my daughter thought it was better than Cafe Zupas. Hello , I made this incredible chili and omg it was delicious , could you please tell me about how many calories is it ? This was DELICIOUS!!! Thank you! You’re welcome! 🙂 Glad it was a hit! Is fat free cream cheese ok? I wouldn’t recommend it, but a few have used it and said it was fine. 🙂 The consistency of the soup may be off. I entered this into my workplace chili cook off. Won second place at my dealership. I then competed in a second cook off with the top winners from another dealership. Won first place! This is my first time at your site, which I discovered on Pinterest, looking for a crockpot chicken enchilada recipe. I have not made this recipe yet but I just wanted to thank you for posting nutritional information! So many bloggers do not, and I really appreciate it as my daughter and I both need to watch fat, carbs, sugars, etc. I plan to make this with turkey thighs (we are not fans of white meat poultry) and to substitute seasoned salt with Goya Adobo seasoning (garlic, oregano, salt, black pepper). I’m sure it will be delicious. Thanks, and I look forward to visiting your site often in future. You are so kind to take the time to thank me; I appreciate it! I hope you love whatever you try Susan! Just wanted to thank you for this recipe. Tried it last weekend to rave reviews. Made a couple of changes–reduced the chicken stock to 1 1/2 cups, added two chopped fresh jalapenos and used boneless skinless chicken thighs (my husband prefers dark meat) instead of chicken breasts. Delicious! Made this for my family today. Absolutely delicious! Forgot to buy lime but followed all other suggestions. Thanks it was a hit! This recipe is a 10/10. I also added a whole chopped red capsicum, used plain red kidney beans & half a small tin of tomato paste, half a large can of corn. 1/4 teaspoon of Mexican chilli NOT cayenne pepper. Used 3 chicken breasts & there was a lot, would use 2 breasts next time. I left out the cream cheese & served it on the side. Can you use green enchilada sauce instead of red ? I never leave comments about recipes I try from Pinterest, mainly because they turn out O.K. And aren’t really noteworthy. This recipe, however, is hands-down one of the best things I have ever eaten. My boyfriend ate three bowls and said “this stuff should win an award!”. Thank you for posting this super easy super delicious recipe. Oh you made my day! I’m so happy to hear that 🙂 Thanks for the comment! I am wanting to make this for a ladies night out.Could I double the recipe? I didn’t drain the corn, big deal? Hi Chelsea! I love this recipe & it’s become a fast household favorite for me! I was wondering if I could have your permission to show case the recipe/picture on my blog and give credit to you and link back to your website? I want to make this for a work party. Could I cook it on a Sunday, and then rewarm and serve on a Tuesday? I am very excited to try this out! My husband works night shift so wondering if keeping it on warm (with the cream cheese) for 7 hours would ruin it? Thanks so much! Unfortunately no; I wouldn’t recommend keeping it on warm with the cream cheese or the chicken. The cream cheese will become curdled and the chicken likely unsafe to eat. Wow, Such a quick response! Thank you, I just had a bowl with some jalepeno and it was absolutely AMAZING! I didn’t want to stop! Portioned it in the refrigerator due to your advice and can’t wait for hubby to come home and try it. Thanks again and I’m certain this will be a repeat in our home! I’m making this for a chili potluck tomorrow. If I made the entirety of the recipe today, minus the cream cheese then added the cream cheese in right before the potluck tomorrow it should still taste fine right? I just don’t want to ruin it by adding in the cream cheese today, refrigerating tonight then rewarmingnit tomorrow? I have made this soup three times in the last three weeks! It is SO amazing!!! Everyone has been so impressed with my new cooking skills (which is funny because this recipe is so easy!!) thank you Chelsea for your blog, I have made a few other things (like the homemade kid oatmeal clif bar which is my absolute favorite healthy treat now!) and I’m never disappointed with your recipes! Keep me coming!! You do such a great job!!! Why is the sodium content so high? I want to make this recipe but I’m trying to avoid ingesting too much salt. You can reduce or omit the salt if desired! This was so tasty! I was worried about the sodium content being so high so I pretty much grabbed any no salt added version of the canned foods possible. I don’t think the chicken stock is really necessary because of the liquid from some of the cans. The chili came out pretty runny, even with the rice it was much. I would suggest halving the amount of stock at the least if you’re hesitant to remove it all together. My dad doesn’t like creamy food and tried it without the cream cheese and thought it was delicious! So if you don’t want that, it’ll still taste great. I added some lime and cilantro at the end and topped with guac instead of avocado slices. Very yummy. I’m loving the leftovers. This is sooo good! I added garlic powder and put the cream cheese in at the same time as everything else. It was amazing. So happy to hear that! Thanks for the comment Allison! I have everything mixed in the crockpot. It sat in the fridge overnight minus the cream cheese. I plan on cooking today while at work and adding the cream cheese right before guests arrive later this evening. Will that be ok? I also got 30% reduced fat cream cheese should I get regular based off reviews? And I was hoping this could be like chili and leave out while we drink and talk. But based on reviews sounds like I can’t leave out. What is the max time? And if I put in fridge can I reheat entire crock pot or just scoop and warm in microwave? Sorry for dumb questions. Ha. I don’t cook a lot. It looks great but worried I should have stuck with chili now based on what I wanted from a crockpot dish! Ha thank you!!! hello again! Need to correct myself. I have 1/3 reduced fat philledelphia cream cheese. Will it stor and melt well? I made this for a teachers luncheon. It’s always a little scary making something new for other people but holy cow, this is AMAZING! I may have taken a bowl out for myself?. Thanks for the recipe!! Has anyone tried this with ground turkey, precooked? Just tried this recipe on Sunday and love it. I have a 3 qt crock pot (2 person household), which worked–filled right up to the brim, but did not overflow. I used half the prescribed amount of cream cheese, but otherwise followed the recipe to the last detail. Thank you! Does anyone know how it will taste using ground beef??? I plan on browning the beef ahead, so does that affect the cooking time? Also does the stovetop version taste different? The absolute BEST and the easiest to make in a college dorm. My favorite to share with a bunch of friends, thanks so much! Yum!! Made this tonight. Thanks for the recipe. Has anyone tried this in the Instant Pot? I don’t have time to use the crockpot and this sounds like the perfect soup to make. This is really good. I made it for the first time last night and it’s super simple. If your busy and need a quick home cooked meal this is the way to go. My stepson who is a picky eater loved it. I didn’t use Rotel like the recipe calls for and instead used diced tomatoes. I think next time Rotel for sure as it was a little bland otherwise. I think next time I’d also try 1/2 of the cream cheese and it was a little rich for my taste. Other than those minor things this recipe is a winner. I look up recipes to cook all the time that are easy since I’m busy during the week, but most of them need lots of alteration to make good. This one is perfect out of the box. We absolutely loved it. Great flavor. I did not make any changes. I have put some in the freezer. Fingers crossed it comes out well. I will make this again. AMAZING! Made this last night. Only change I made was adding a bag of frozen corn and green beans and lots of crushed red pepper cause we like it spicy. I also took another persons comment to good use. I stirred my room temp cream cheese into a little of the hot liquid and it came out PERFECT!!!!!! This recipe was delicious only difference I added onion, green pepper, & fresh garlic. I made this today for my office (I’m a nurse for a medical clinic) and everyone loved it. I just threw everything it and even left out all of the extra seasonings because I didn’t want to overwhelm it. Traded raw chicken breast for frozen precooked and preshreded chicken. Was a hotbed with my boss and coworkers. I’m so glad everyone loved it! And sounds delicious! Thanks for your comment!